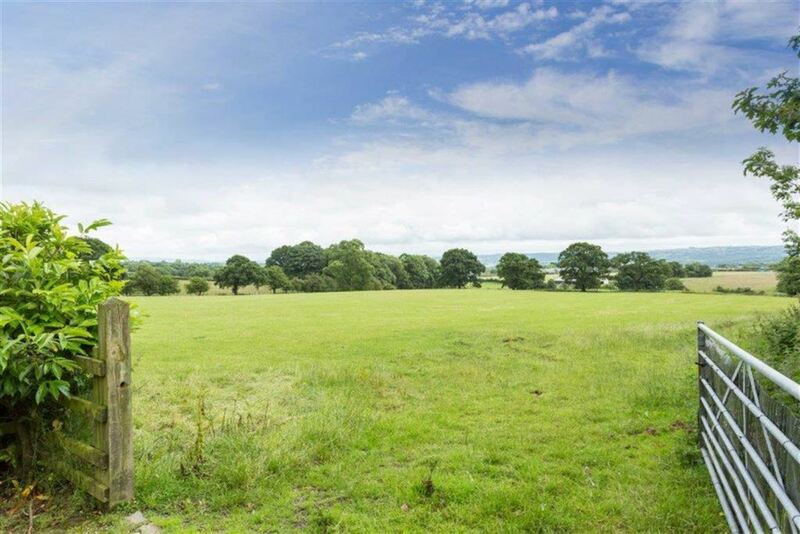 **Four Acres of Land Available via Separate Negotiation** ''Ashdene'' is a striking, traditionally styled property, which was sympathetically constructed for its current occupants by Dewhurst Homes Limited in 2005. 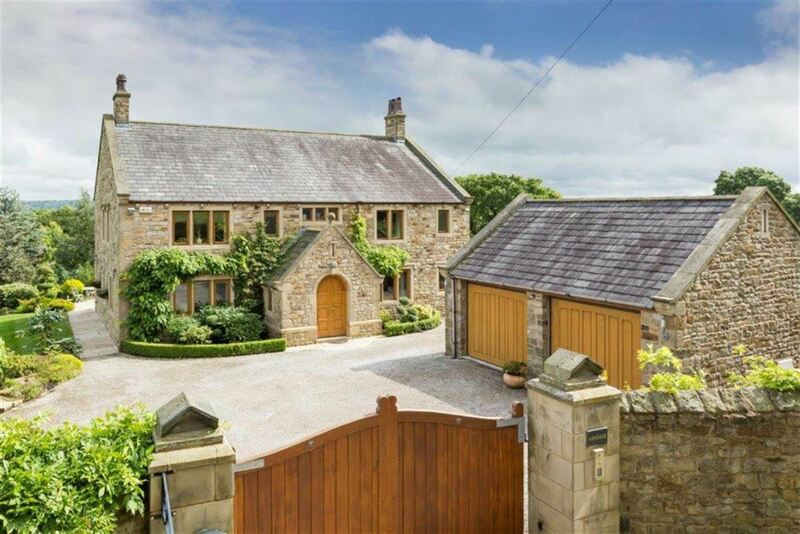 Boasting an enviable position on the rural outskirts of Longridge, yet being within easy reach of amenities, highly regarded schools such as Stonyhurst College, and not far from network links to Clitheroe and Preston, this truly luxurious residence flows with an abundance of high quality finishes and is the dream up size for any growing family! 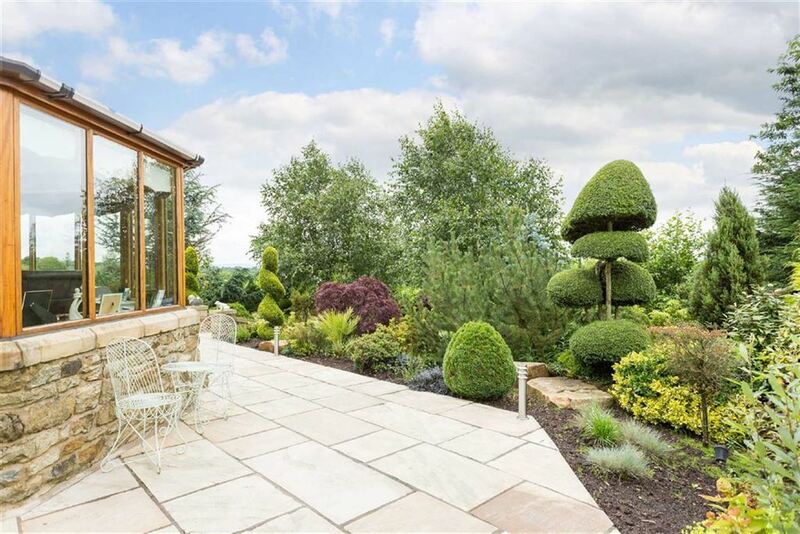 The property sits on a one acre plot of beautifully manicured gardens which are secured by high stone walls and solid oak electric gates. 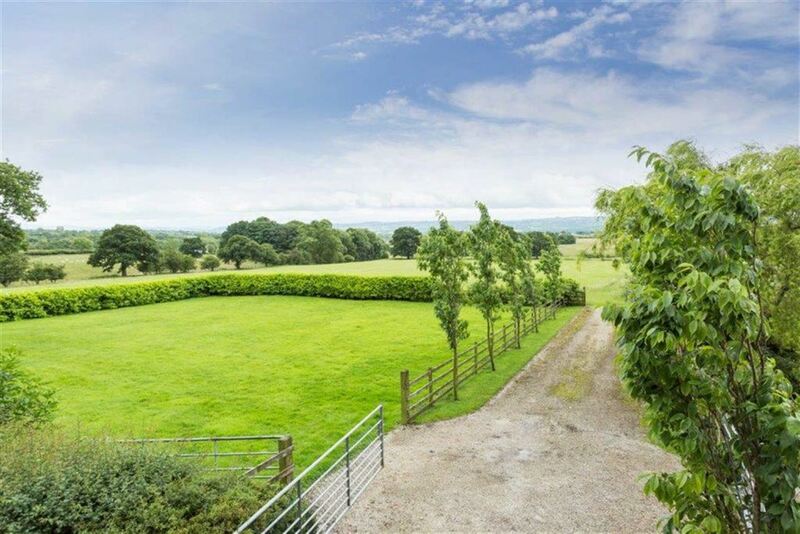 The property runs alongside four acres of land and an additional one acre paddock which is also available with separate negotiation. 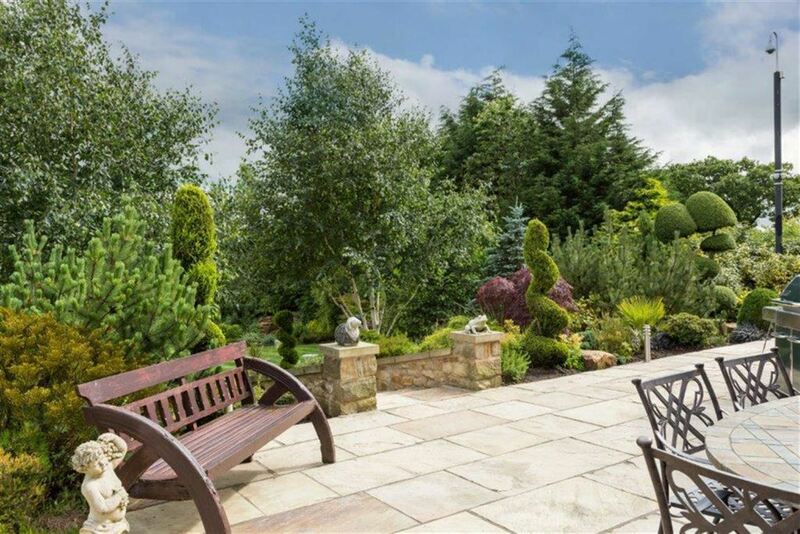 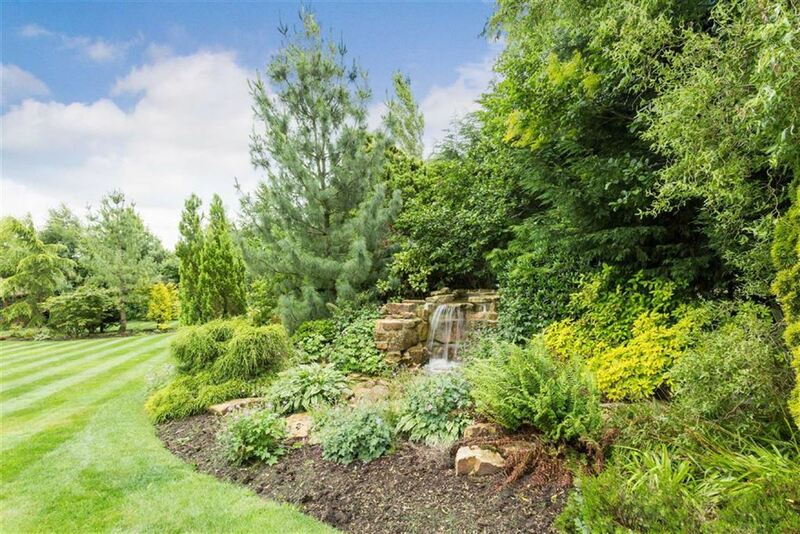 The rear garden has been extensively planted with mature perennials, deciduous trees and conifers and boasts a calming waterfall rockery, an Amdega summer house, a double detached garage and outdoor lighting from corner to corner. 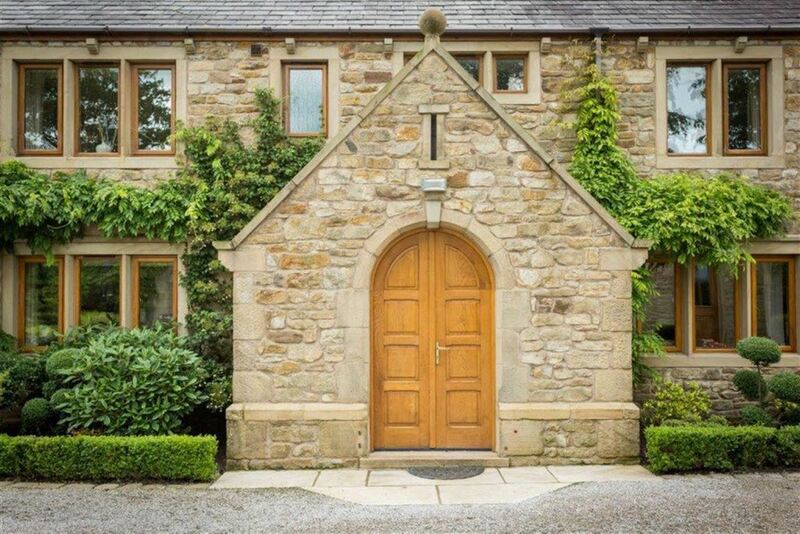 Entering the property through an arched Oak doorway you will find a porch. 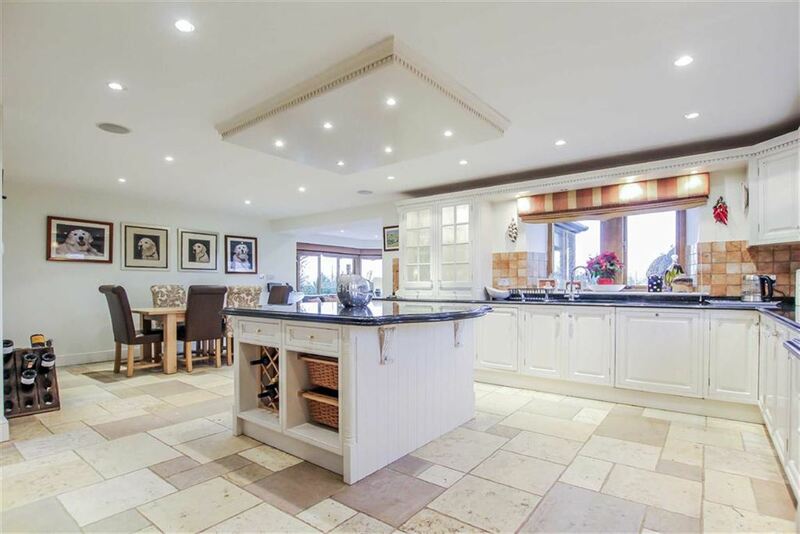 The porch provides access to a welcoming entrance hallway which has Travertine flooring and Oak framed doors leading to the office, WC, dining room, a bright and elegantly finished lounge and a spectacular open plan dining kitchen. 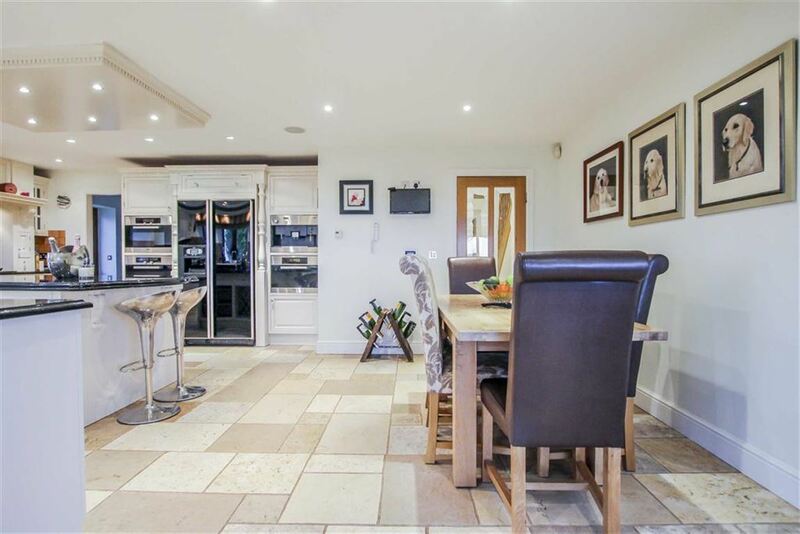 The dining kitchen is fitted with a range of hand crafted Oak units and features a solid granite work surface as well as a number of Miele appliances, including a steam oven, dish washer, coffee machine and plate warmer. 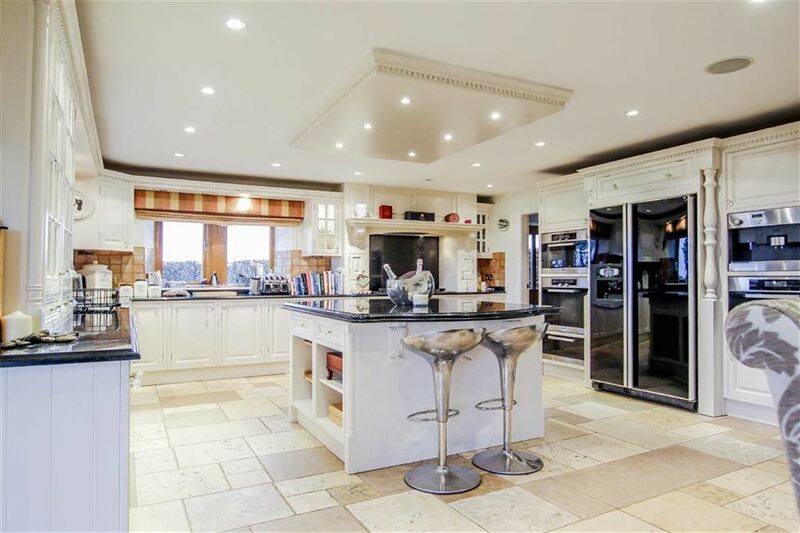 The kitchen benefits from a superb island unit and provides access to a sun lounge and a utility room. 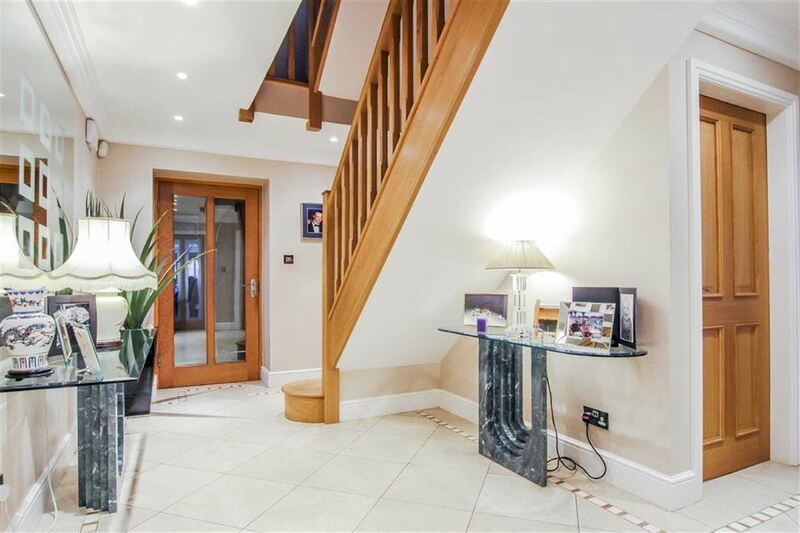 To the first floor, you will find a gallery landing which houses a solid Oak staircase to the first floor and Oak doors leading to four double en-suite bedrooms. 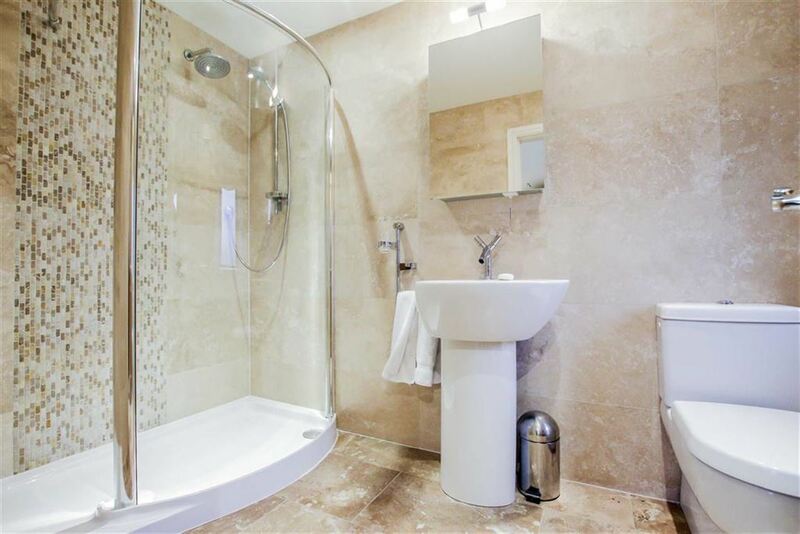 The en-suites are all fitted with quality bathroom suites with Villeroy and Boch accents in each. 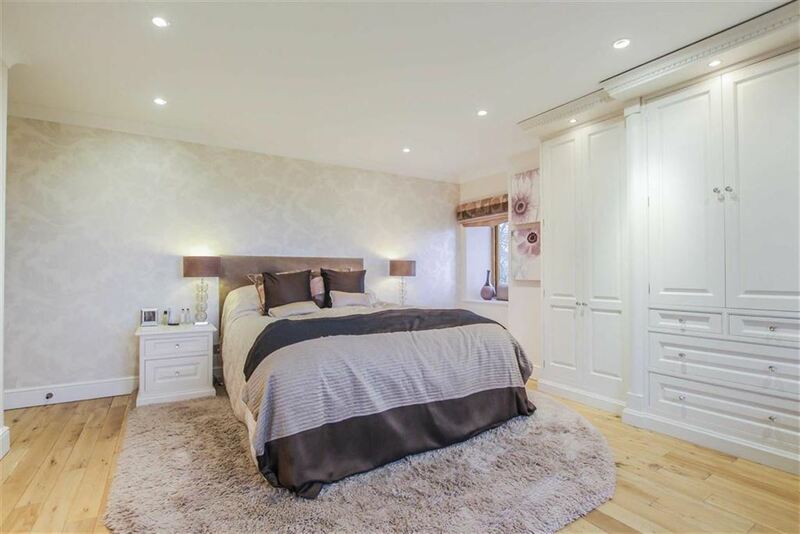 The master bedroom boasts a state of the art steam shower, where you can enjoy a eucalyptus sauna. 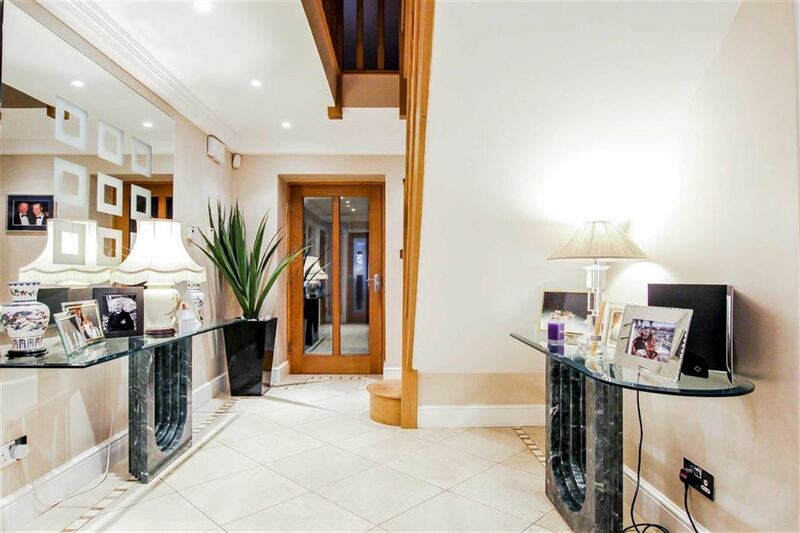 To the second floor, this beautiful home features a further two double bedrooms alongside a three piece shower room. 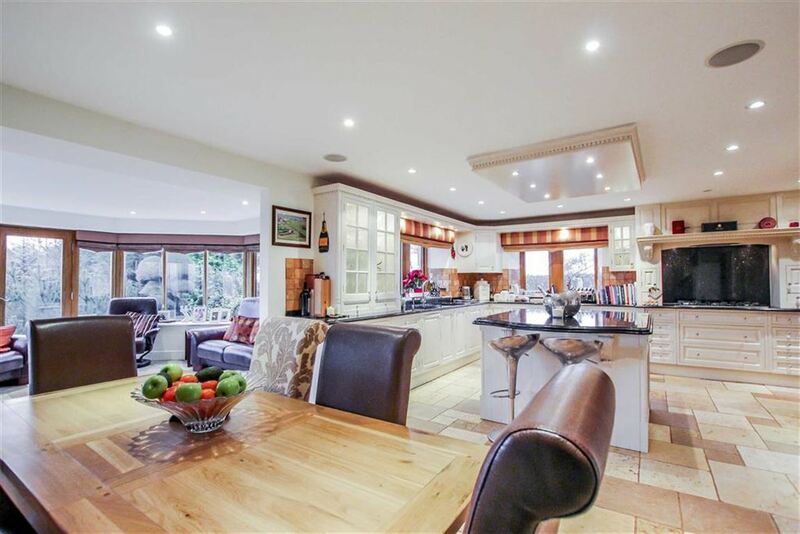 This truly magnificent home requires internal inspection to appreciate what it has to offer. 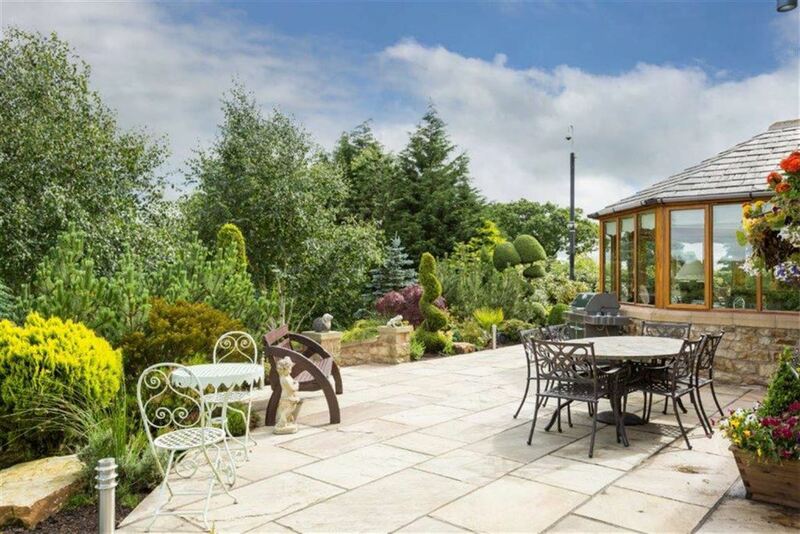 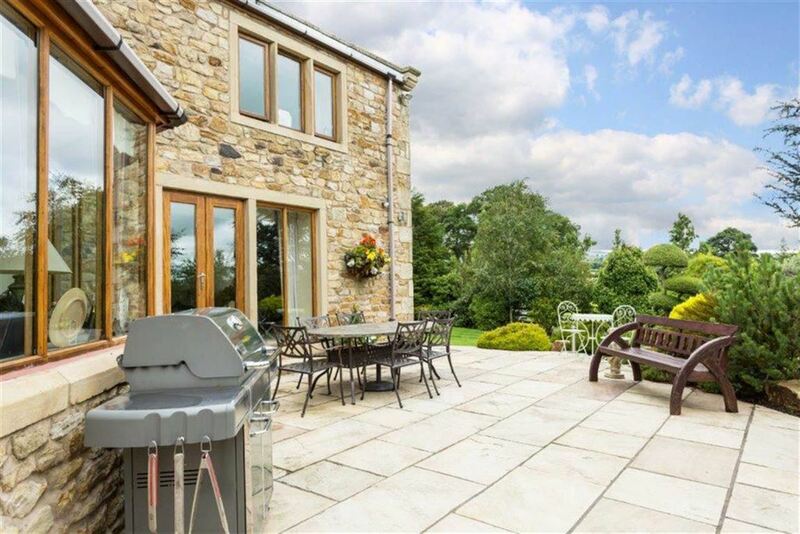 For further information or to arrange a viewing, please call our Ribble Valley team today. 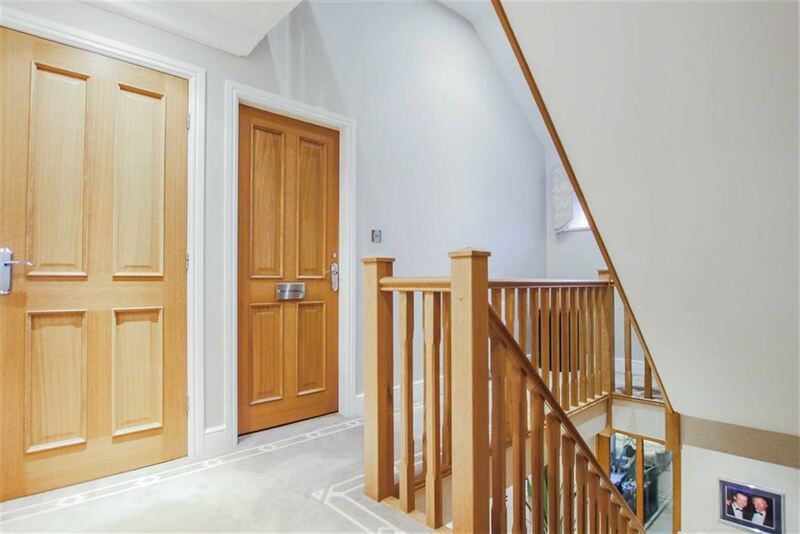 Solid Oak double doors leading into the porch. 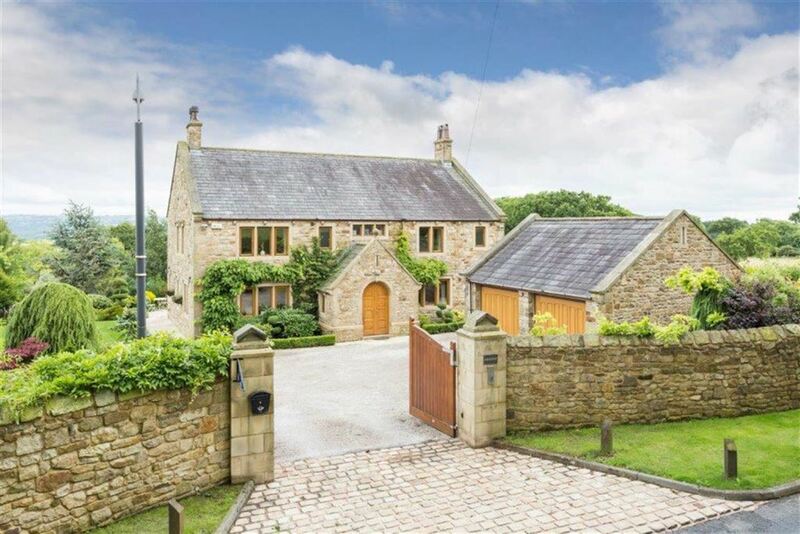 Two Oak double glazed windows, Indian stone flagged flooring, pitched roof and an Oak single glazed door leading into the hall. 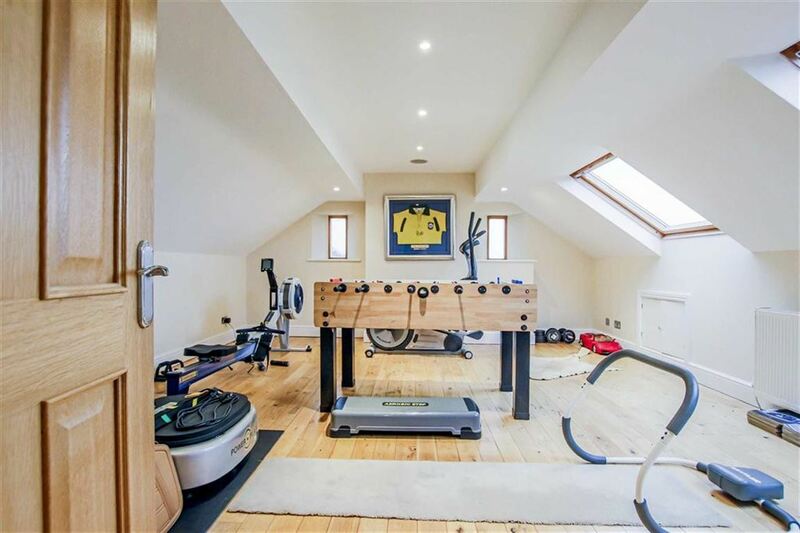 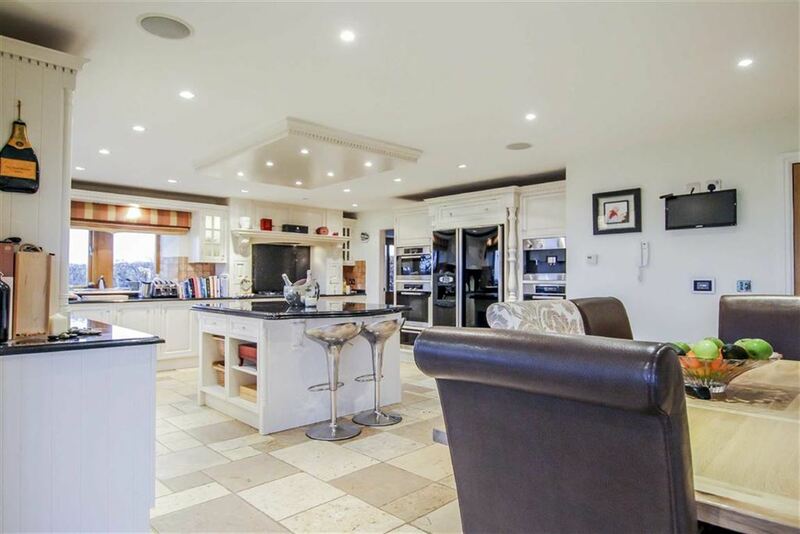 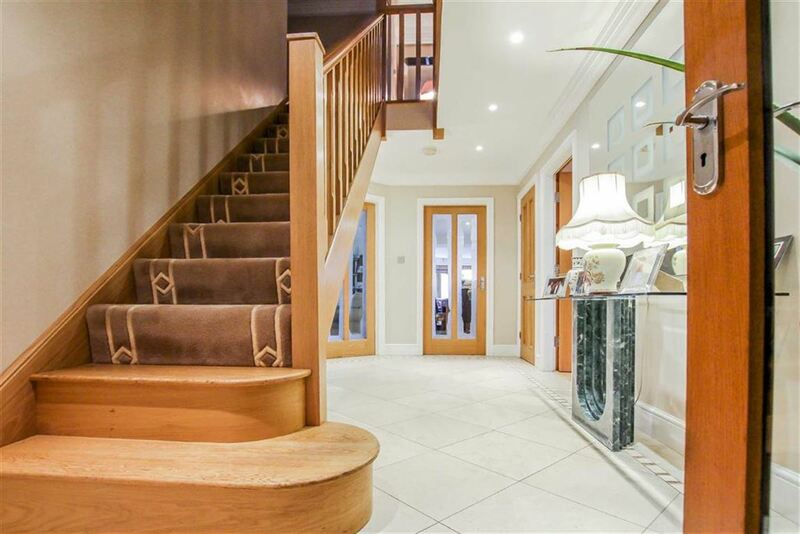 Travertine tiled flooring, under-floor heating, Oak stairs leading to the first floor, cornice coving to the ceiling, spotlights and doors leading to the study, storage room, dining kitchen, two reception rooms and to the WC. 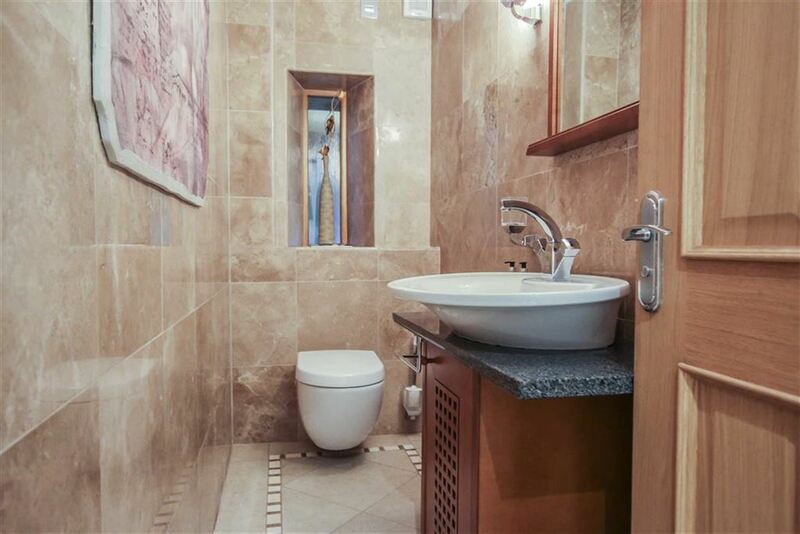 Oak frosted window, Villeroy and Boch two piece suite comprises: a twin flush WC, table top wash basin, polished Travertine tiled elevations, Travertine tiled flooring, two feature wall lights and an extractor fan. 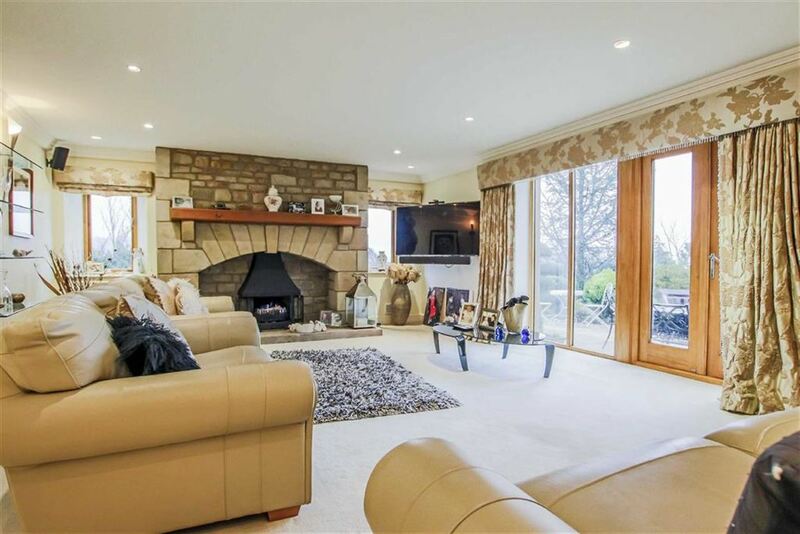 Two Oak double glazed windows, Oak double glazed garden window, Oak double glazed French doors leading out to the rear, under-floor heating, cornice coving to the ceiling, spotlights, television point, surround sound, cast iron gas fire to an Inglenook stone fire surround and Pine mantle and feature wall lights. 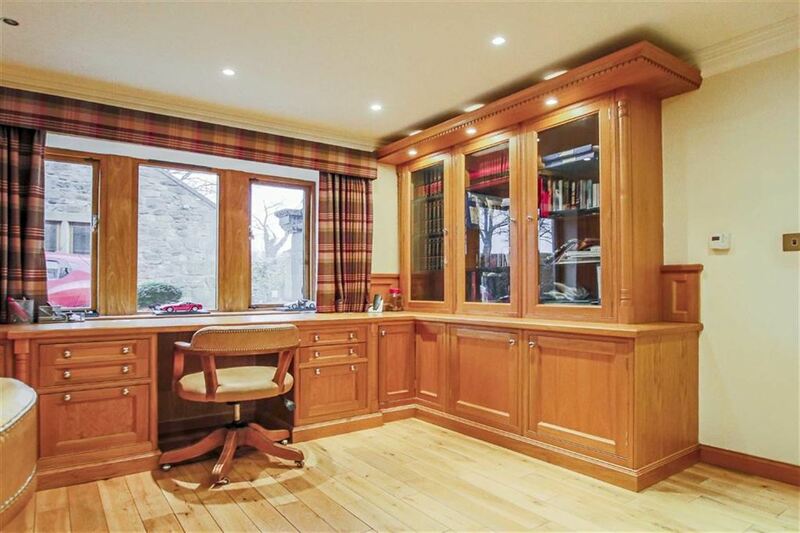 Oak double glazed mullion window, Oak flooring, under-floor heating, cornice coving to the ceiling, spotlights and an Oak carved office space. 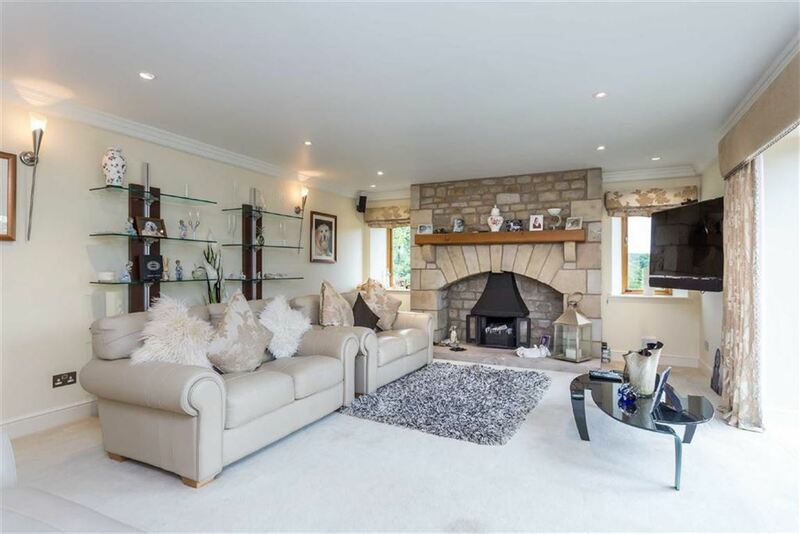 Two Oak double glazed windows, cast iron multi-fuel to a corner stone fireplace, Travertine tiled flooring, under-floor heating, cornice coving to the ceiling and surround sound. 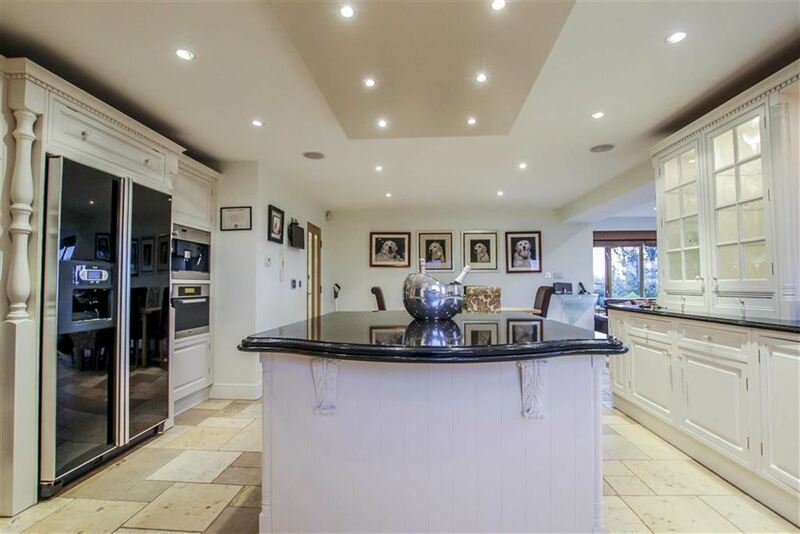 Two Oak double glazed windows, a range of professionally hand crafted cream panelled wall and base units, solid granite work surfaces and upstands, tiled splash-backs, one and half bowl stainless steel Franke sink, surface draining ridges and a high arch mixer tap with a filtered water tap, integrated Whirlpool American fridge freezer, Miele double fan oven and grill, coffee machine, integrated microwave, plate warming drawer, steam oven, a five ring Miele Calor gas hob, extractor hood, integrated Miele dishwasher, Travertine tiled flooring, under-floor heating, island unit, display units, downlighters, an opening leading to the sun lounge and an Oak door leading to the utility room. 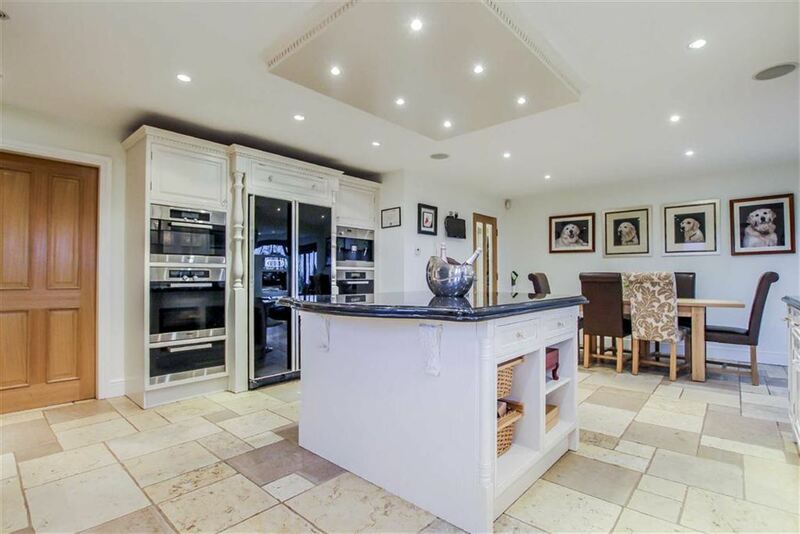 Oak double glazed window and door leading to the rear, Travertine tiled flooring, hand crafted cream panelled base unit with solid granite work surface, tiled splash-backs, plumbing for a washing machine, space for a tumble dryer, inset Franke sink, surface draining ridges, high arch mixer tap and a Glo-worm central heating boiler. 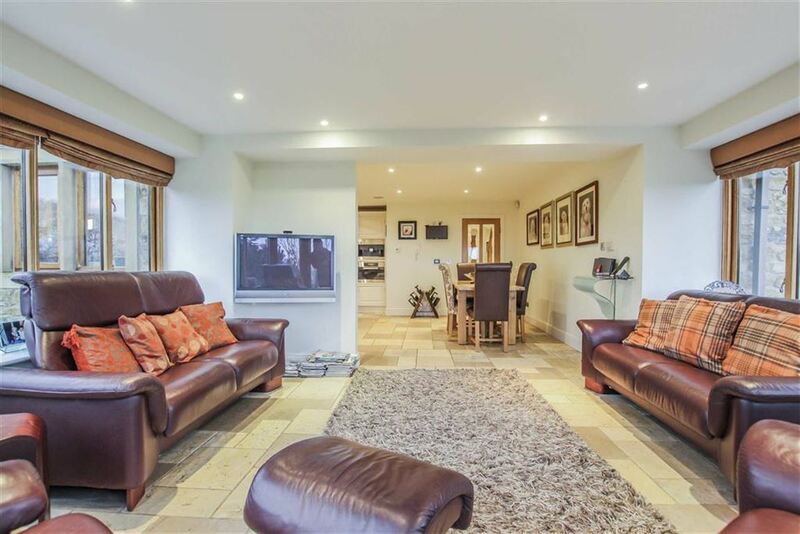 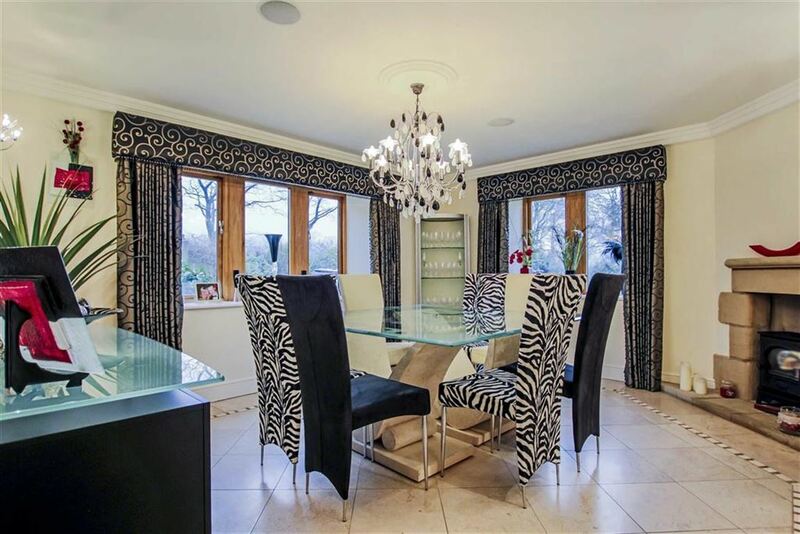 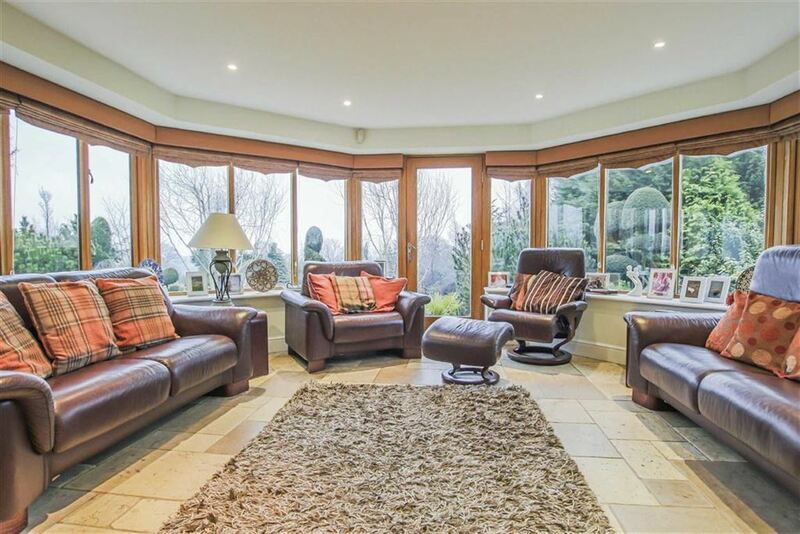 Oak double glazed window, Travertine tiled flooring, under-floor heating, television point and spotlights. 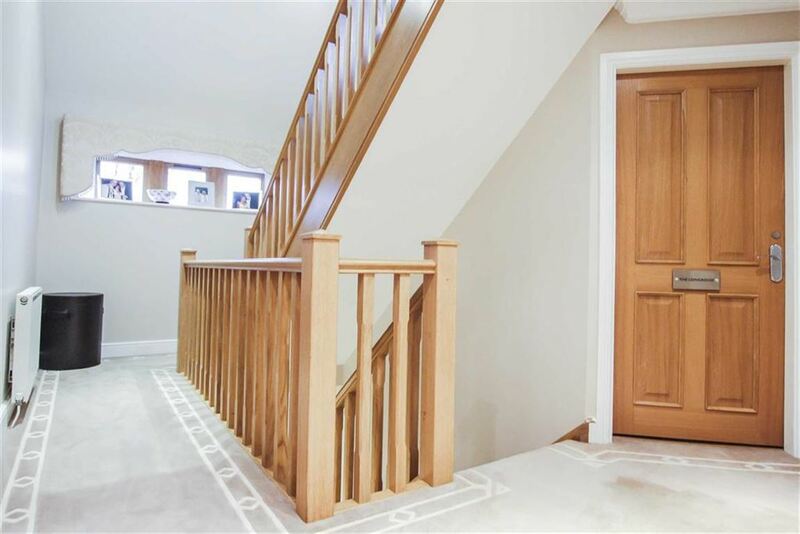 Oak double glazed window, Oak stairs leading to the second floor, fitted linen cupboard and Oak doors leading to four bedrooms. 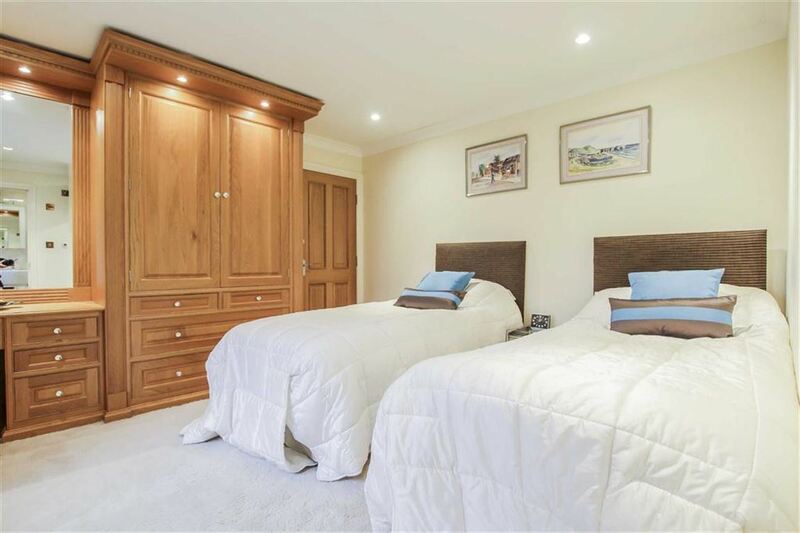 Two Oak double glazed windows, central heating radiator, fitted Oak carved wall to wall wardrobes and dresser with downlighters, spotlights, surround sound and a door leading to the en-suite. 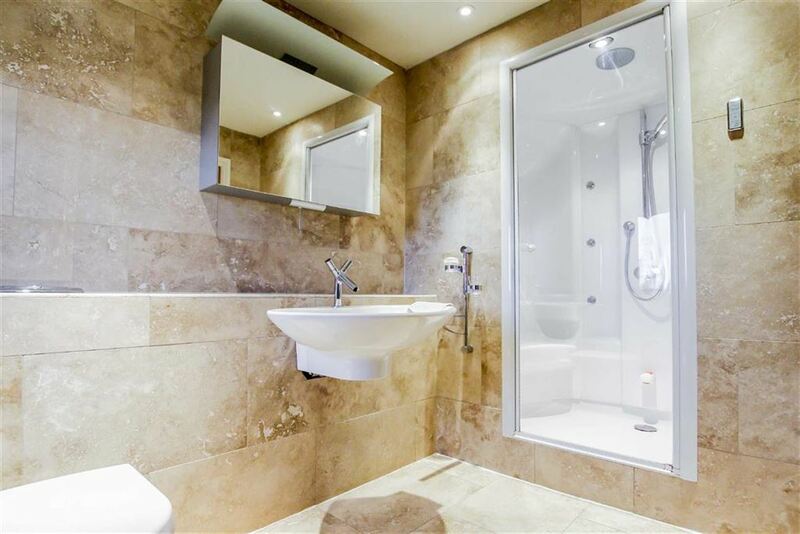 Oak double glazed window, four piece suite comprises: a Villeroy and Boch jacuzzi bath with jets and shower head, a vanity top wash basin with mixer tap, corner shower cubicle with direct feed shower, WC, Travertine tiled elevations, Travertine tiled flooring and chrome heated towel rail. 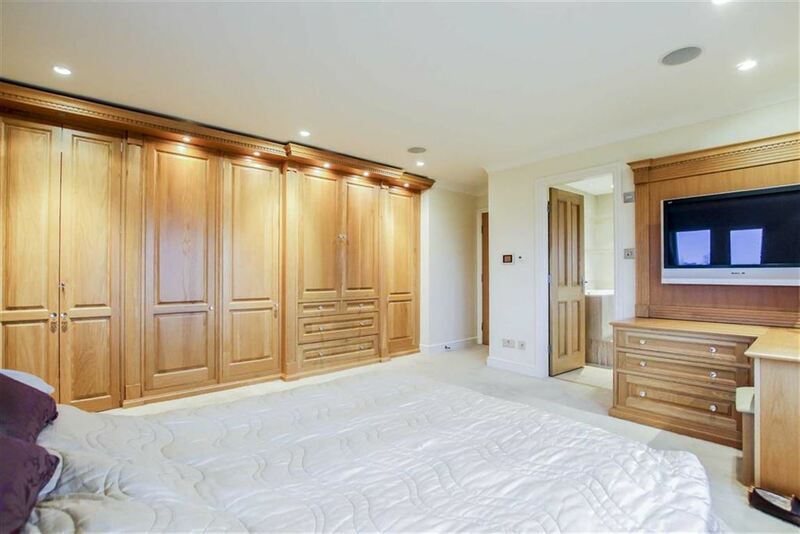 Two Oak double glazed windows, central heating radiator, Oak flooring, fitted wardrobes and dresser and a door leading to the en-suite. 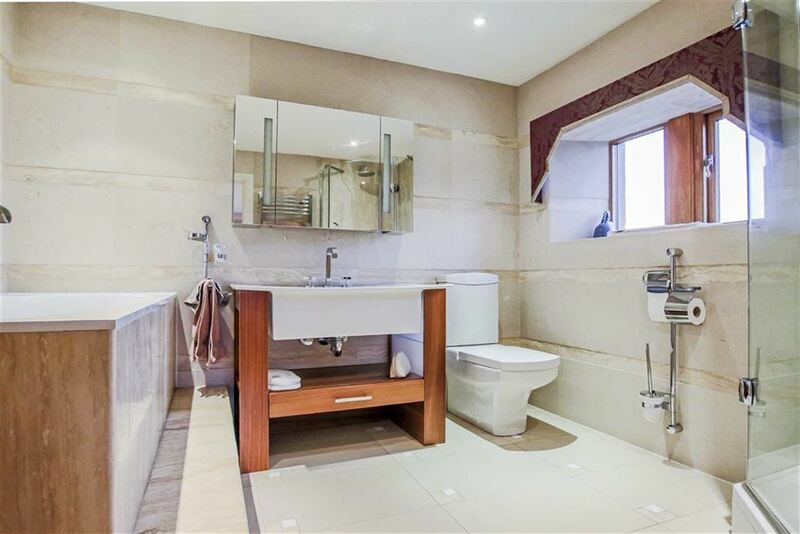 Oak double glazed window, four piece suite comprises: steam sauna shower enclosure, elevated Villeroy and Boch wash basin, twin flush WC, chrome heated towel rail, spotlights, Travertine tiled elevations and Travertine tiled flooring. 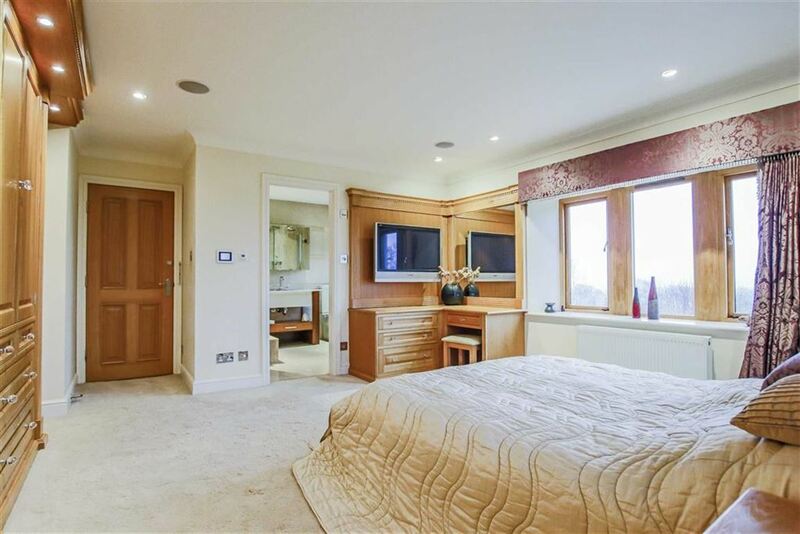 Two Oak double glazed windows, central heating radiator, spotlights, coving to the ceiling and a door leading to the en-suite. 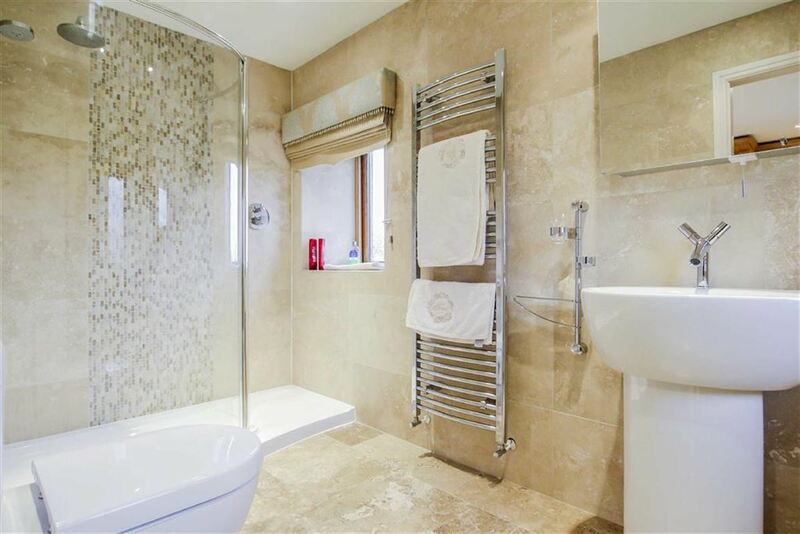 Oak double glazed frosted window, three piece suite comprises: a double shower enclosure with direct feed shower head, a Villeroy and Boch WC, pedestal wash basin, Travertine tiled elevations, Travertine tiled flooring, spotlights and a chrome heated towel rail. 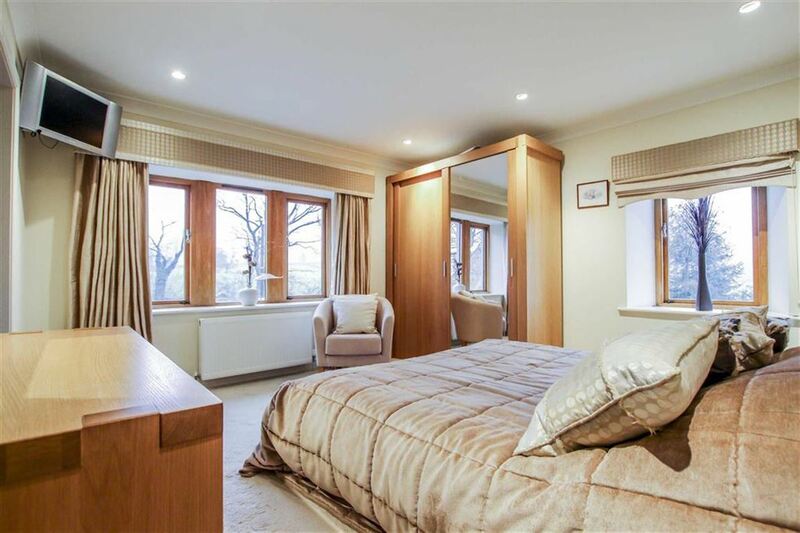 Oak double glazed window, central heating radiator, Oak fitted wardrobes, coving to the ceiling, spotlights and an Oak door leading to the en-suite. 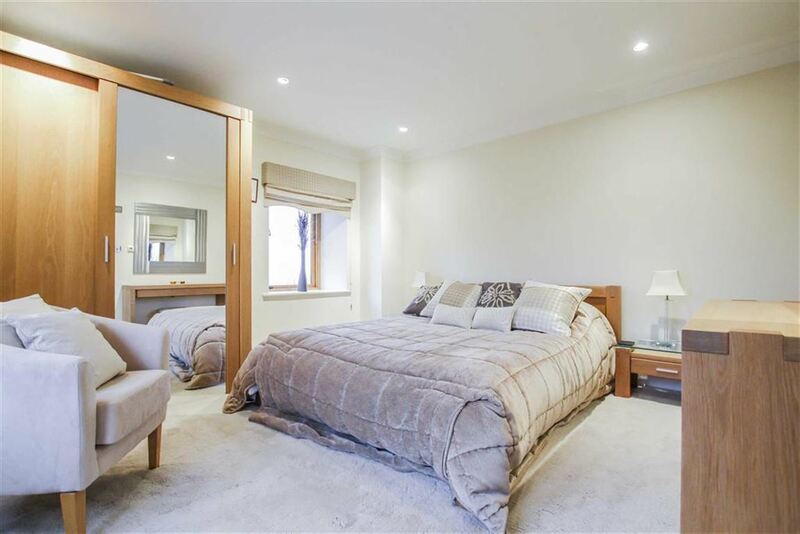 Two Oak double glazed windows, three piece suite comprises: double shower enclosure with direct feed shower head, Villeroy and Boch twin flush WC, pedestal wash basin, Travertine tiled elevations, Travertine tiled flooring, chrome heated towel rail and spotlights. 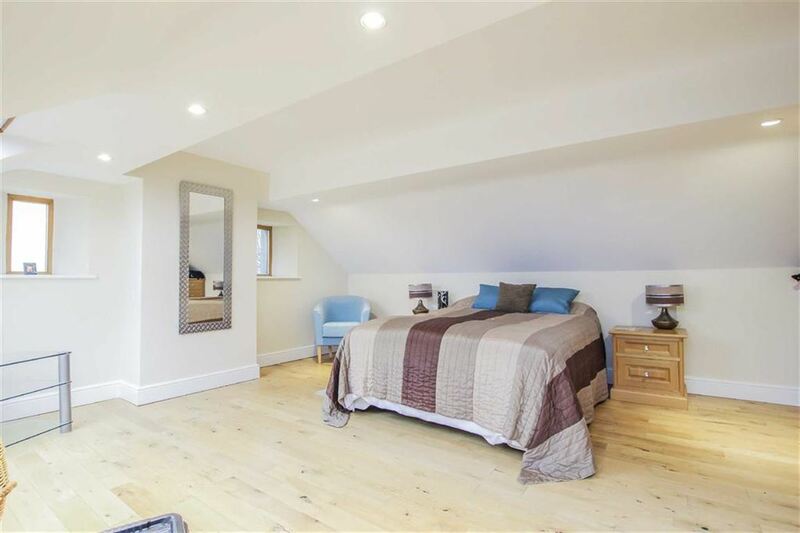 Cornice coving to the ceiling, spotlights, smoke alarm and doors leading to the shower room and to two bedrooms. 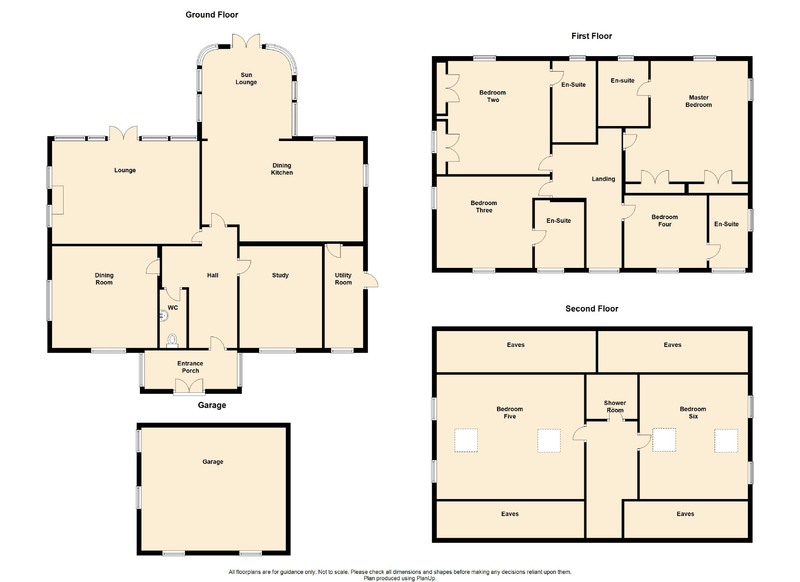 Two Velux windows, two Oak double glazed windows, Oak flooring, eaves access, fitted wardrobes and spotlights. 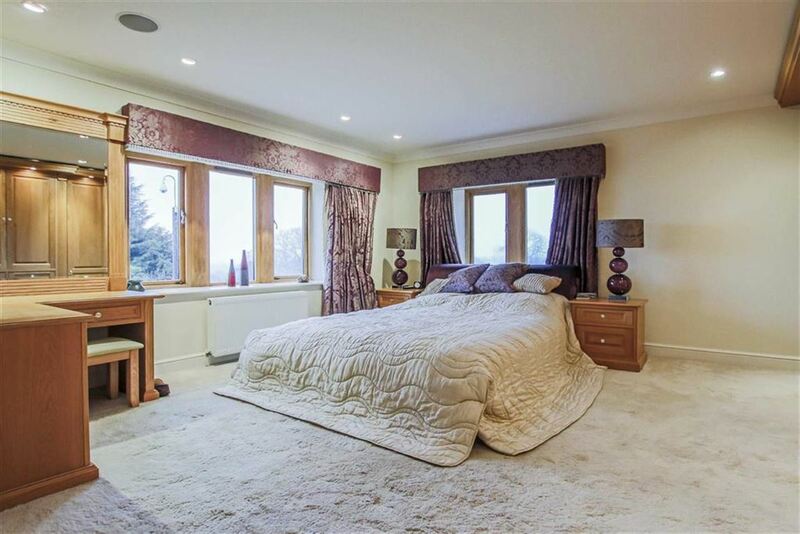 Two Velux windows, two Oak double glazed windows, central heating radiator, eaves access and Oak flooring. 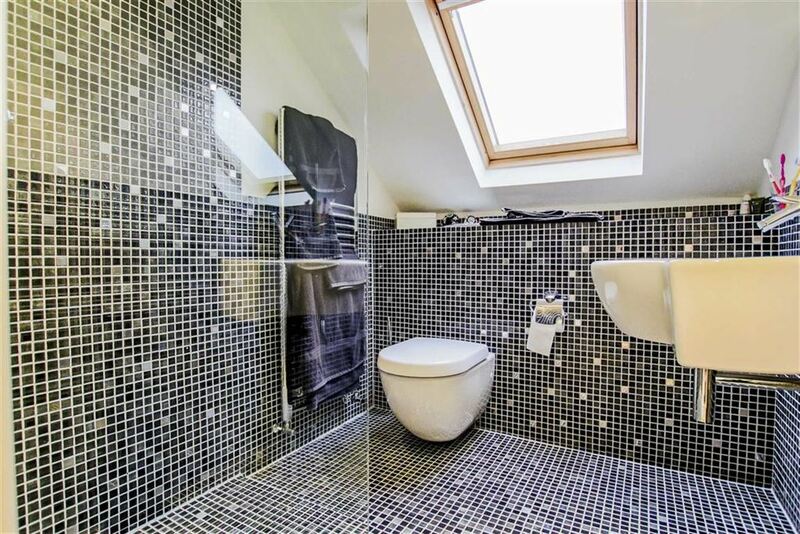 Velux window, three piece suite comprises: wet room style shower with direct feed shower head, elevated wash basin, elevated WC, chrome heated towel rail, full mosaic tiled elevations and flooring and an extractor fan. 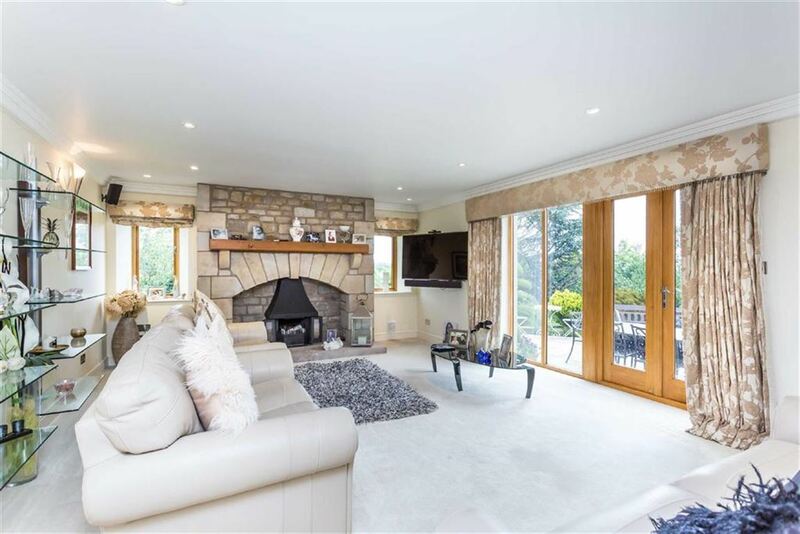 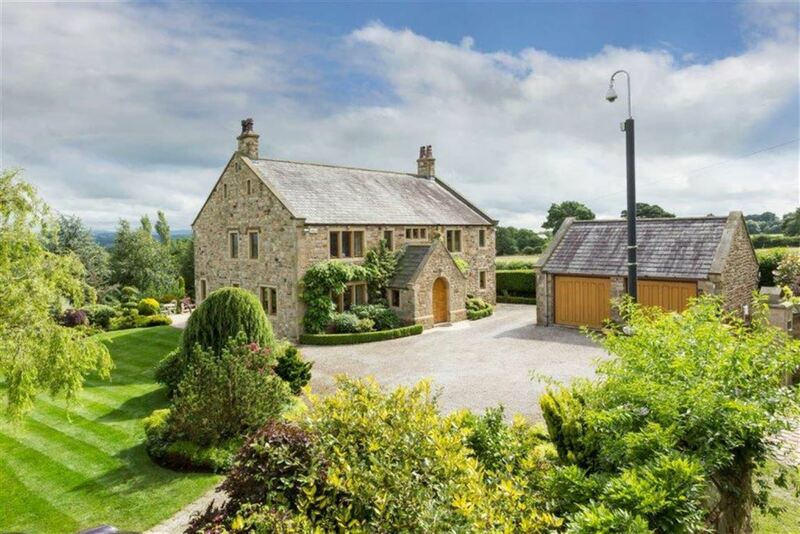 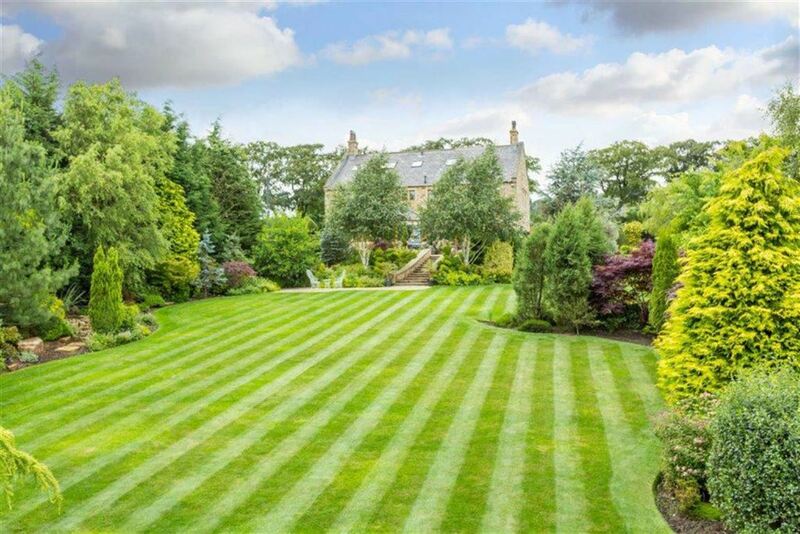 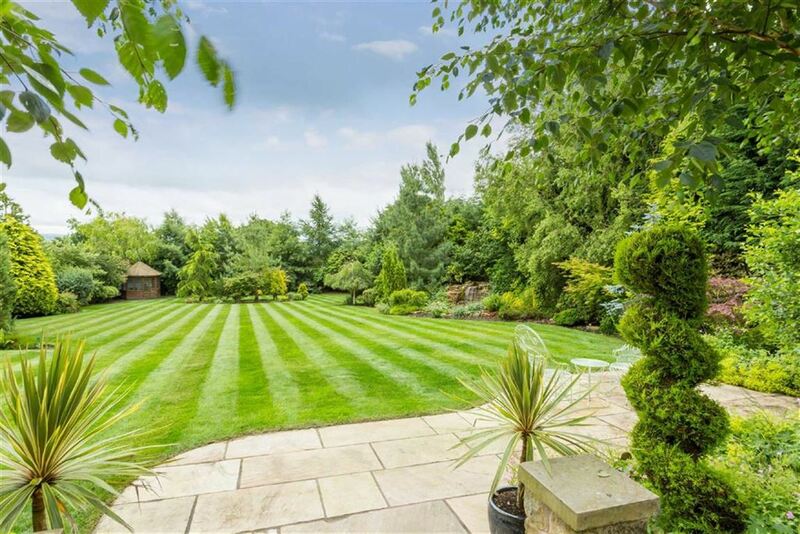 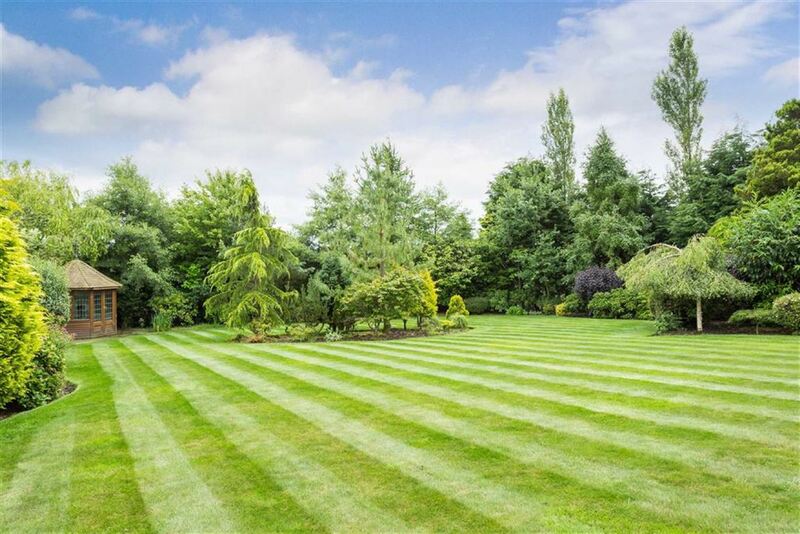 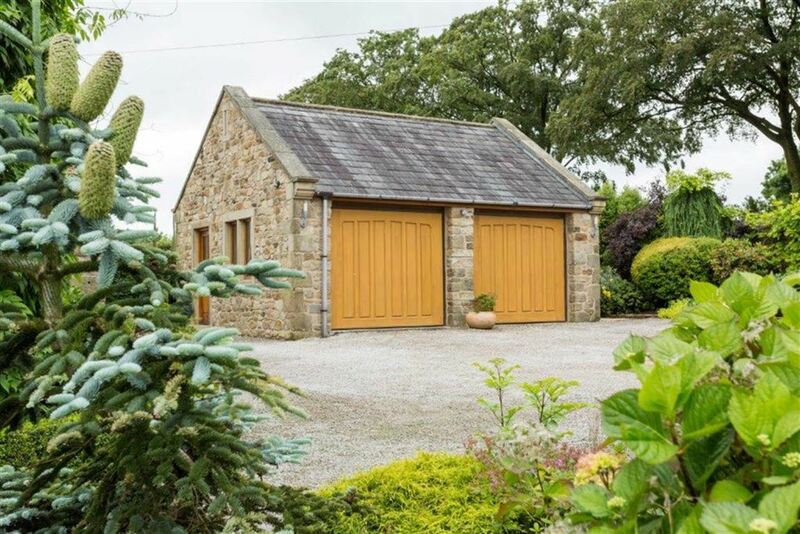 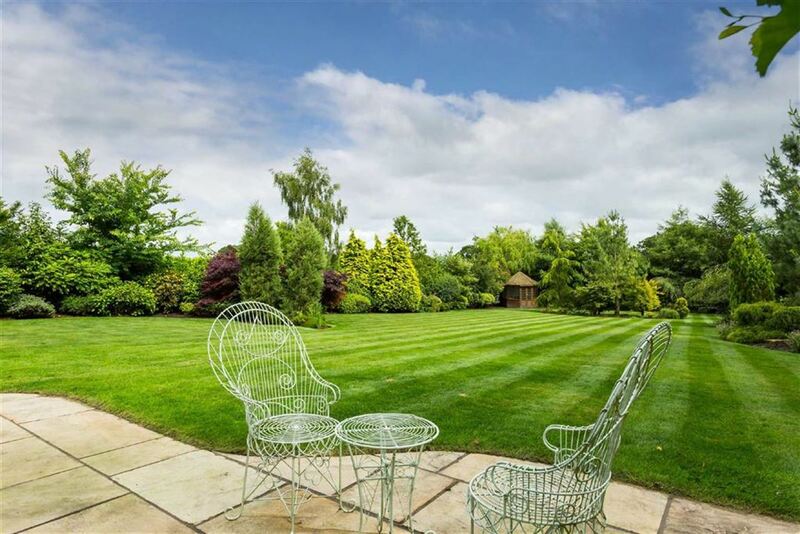 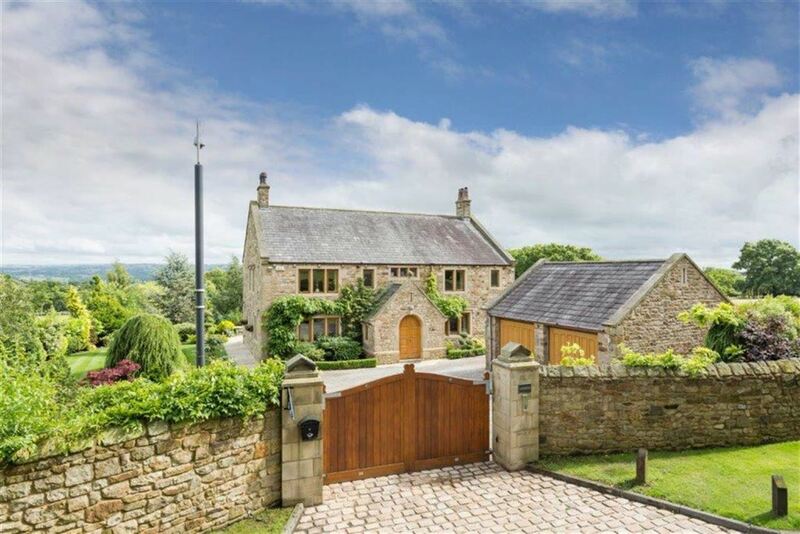 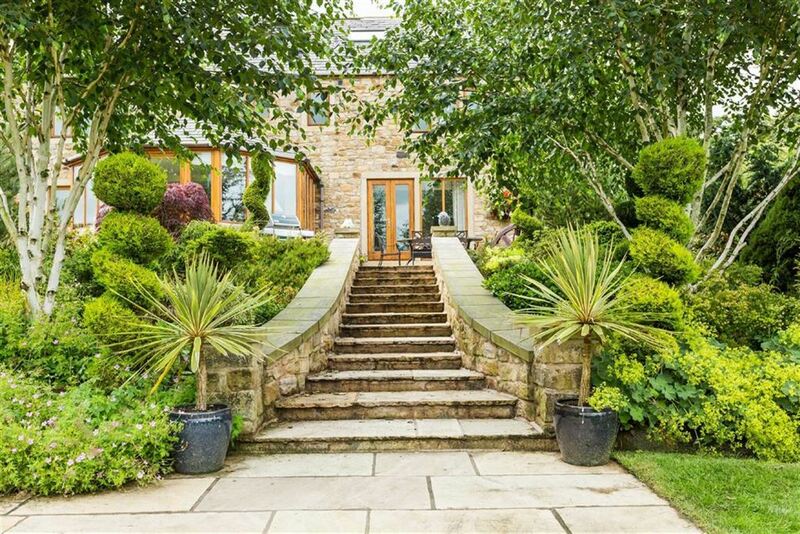 The property sits in its own five acre plot of beautifully manicured gardens which are secured by high stone walls and solid Oak electric gates. 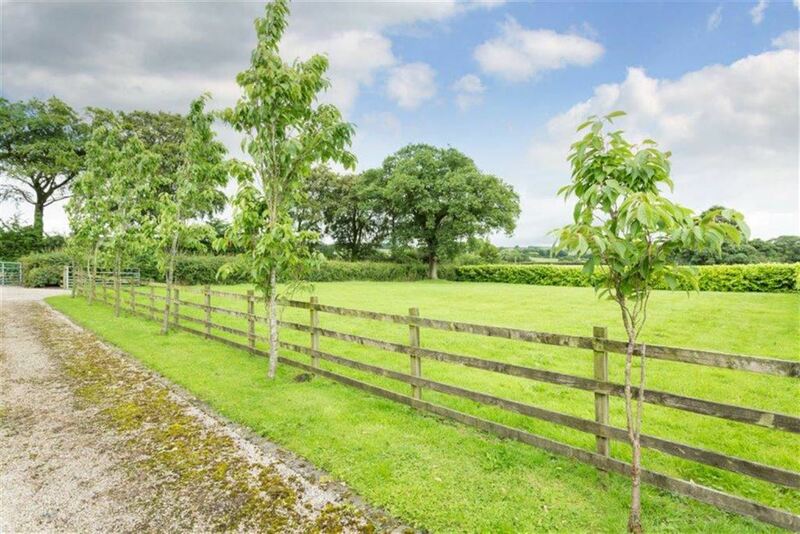 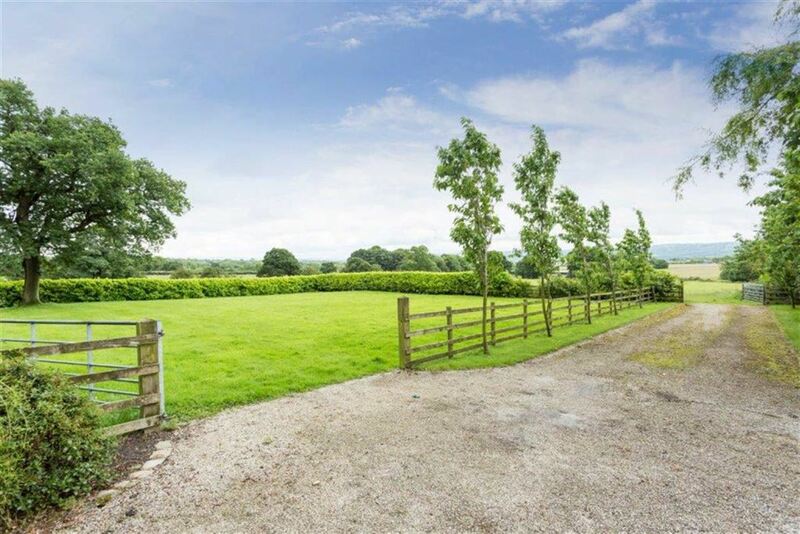 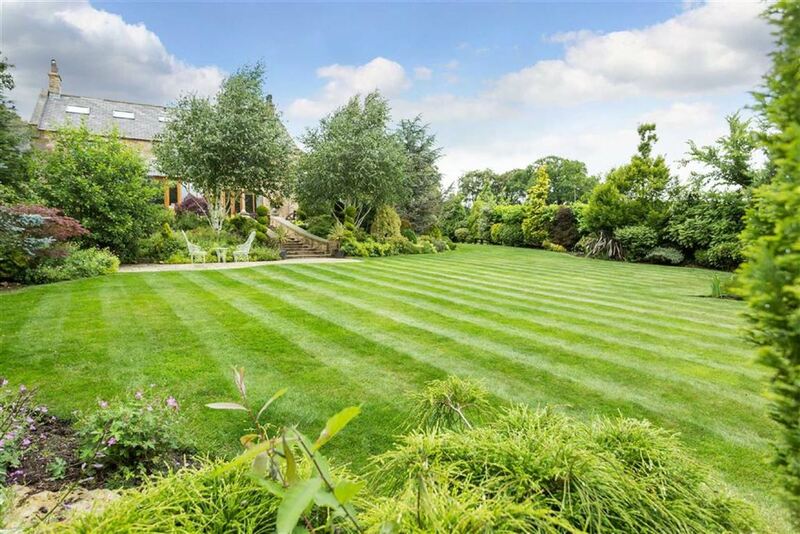 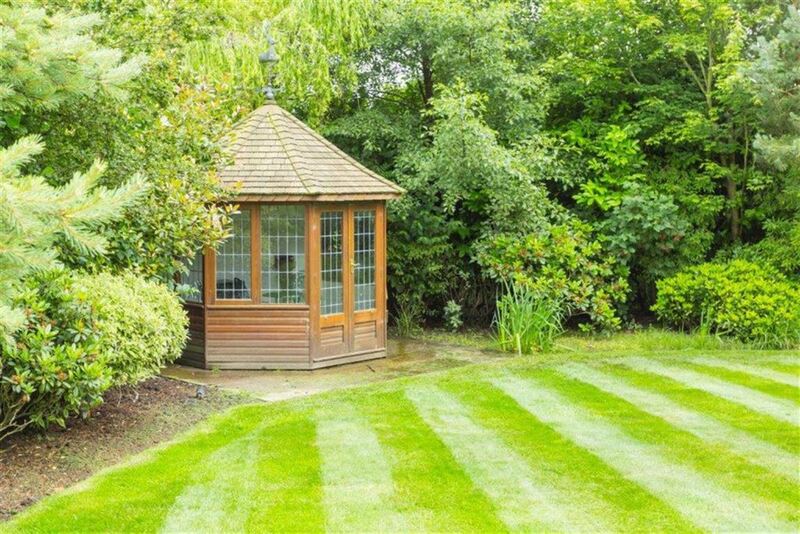 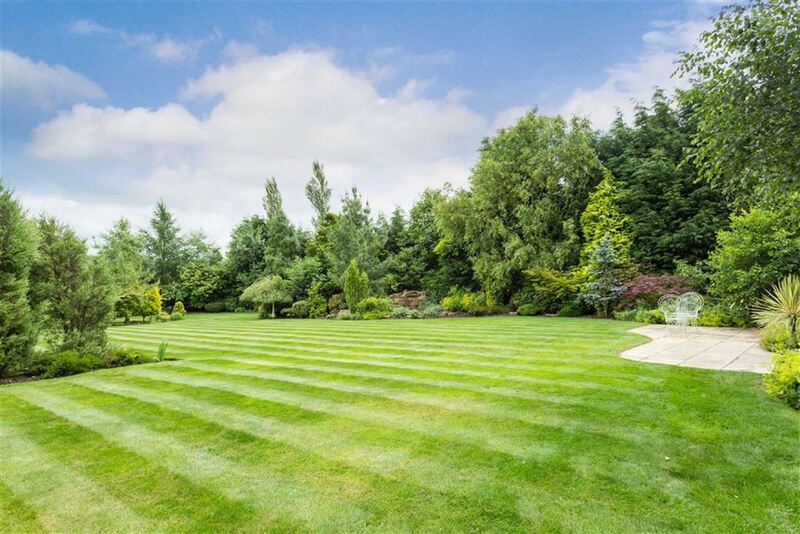 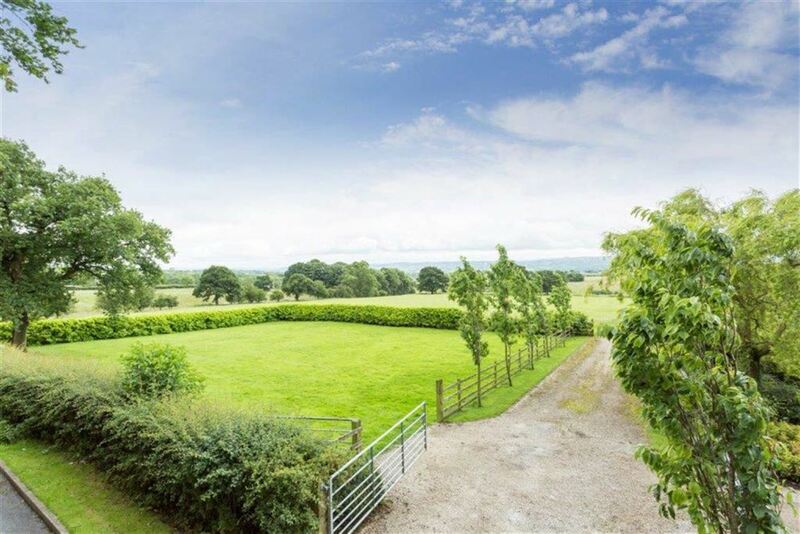 The property runs alongside an additional four acre paddock which is also available with separate negotiation. 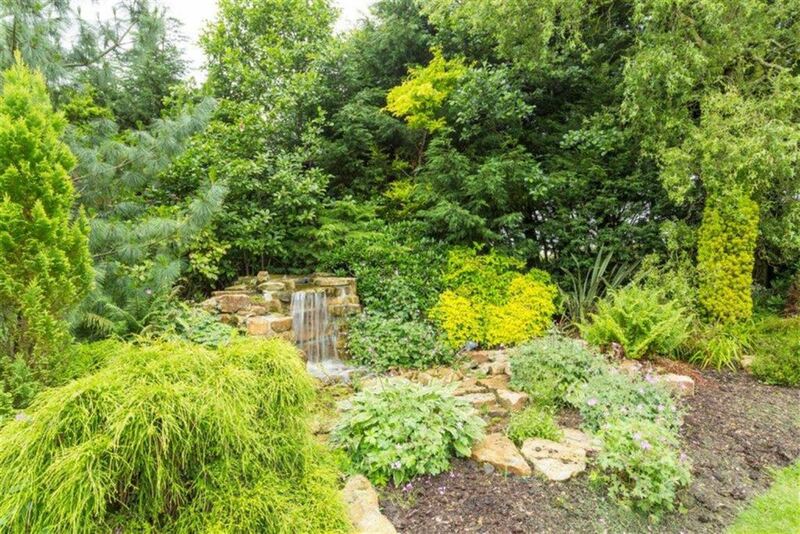 The rear garden has been extensively planted with mature perennials, deciduous trees and conifers, and boasts a calming waterfall rockery and a Amdega summer house, a double detached garage and outdoor lighting from corner to corner.